It's all about the spectacle this Sunday as our Idols swap out the ballads for the bangers! After connecting with our Idols it's clear to see they're a lot more excited than they are nervous to pick up the tempo, dance and show us a side of them we've never seen before. As we speak, our production wizards are putting together the elaborate sets and dramatic visual effects that are going to punctuate every note when the Top 8 go ALL OUT. That said, the right song choice is key and will ultimately be the factor that determines whether a performance resonates with everyone and takes off or misses the mark and falls flat. Here's what the Idols will be moving and shaking to come Sunday night. Here's the full rundown in case you missed anything! 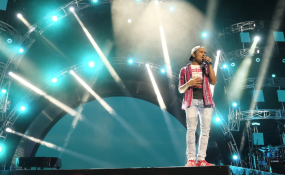 Drop us a tweet using #IdolsSA and let us know who you think is going to be head and shoulders above the rest.